The Soberanes Fire burning along the coastal ridge on July 25, 2016. The final perimeter of the Soberanes Fire, on October 22, 2016. The fire was first reported by hikers in Garrapata State Park at 8:48 a.m. on Friday July 22, 2016, and was later determined to be the result of an unattended illegal campfire. By Saturday morning, the fire had grown to 2,000 acres (810 ha), and forced the evacuation of about 300 homes in the community along Palo Colorado Canyon. By the morning of Sunday, July 24, the fire had grown to over 10,000 acres (4,000 ha), with 5% of the fire perimeter contained. Officials said that Toro Park would be closed so that firefighters could use the area as a base camp. Evacuation warnings were also issued for all of Carmel Highlands. On Tuesday July 26, acting California governor Tom Torlakson declared a state of emergency in Monterey County over the fire. By Saturday July 30, the fire had spread south and east into the Los Padres National Forest. Almost a month later, on August 26, the fire had grown to over 90,000 acres (36,000 ha) and was only 60% contained. 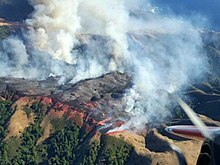 The majority of the fire by then was within the Los Padres National Forest and the Ventana Wilderness, and unified command of the fire suppression work was transferred from the California Department of Forestry and Fire Protection to the United States Forest Service's Alaska Interagency Incident Management Team. By September 18, the fire had increased in size to 113,260 acres (45,830 ha). Containment was still only at 61%, and 1,921 firefighters were at work. Some evacuation orders on the northern perimeter had been lifted, and crews were working on burn-out operations to establish a containment line on the northeast side of the fire, near Chews Ridge. Heavy smoke resulted from the burnouts. As of 23 September 2016[update] the costs to fight the fire exceeded $200 million, the most expensive fire in United States history at the time. On October 9, the fire had burned 132,127 acres (53,470 ha) and was 99% contained. Incident management personnel expected to attain full containment by October 15. Fire personnel had been reduced to 704 workers, with many engaged in fire suppression repair efforts. On October 28, three months after the wildfire had started, fire management personnel reported that the fire was 100% contained, and that remaining smoldering hotspots would be put out by rains expected shortly afterward. By that time, restoration crews had completed suppression repair work on 374 miles (602 km) of the fire line. The largest madrone in the United States was burned and possibly killed by the 2016 Soberanes Fire. Bulldozer operator Robert Reagan, 35, of Fresno County, died July 26, 2016, when his bulldozer overturned while he was building a fire line near Palo Colorado Canyon in Big Sur. The fire destroyed 57 homes and 11 outbuildings in the Garrapata Canyon and Palo Colorado Canyon areas during the first three weeks. Robert Baird, supervisor of the Los Padres National Forest, estimated that firefighters saved US$6.8 billion worth of real estate. The fire burned and possibly killed the largest Pacific madrone tree in the United States, within the Joshua Creek Canyon Ecological Reserve. The tree was 125 feet (38 m) tall and more than 25 feet (7.6 m) in circumference. The madrone was listed on the American Forests National Big Tree list, a register of the biggest trees by species in the United States. The California Department Of Parks And Recreation announced on September 28, 2016 that Garrapata State Park east of Highway 1, where the fire started, would remain closed through the winter. In March 2017, Reagan's family filed a wrongful death suit against the state of California for her husband's death while fighting the fire. They later dropped the suit due to a law that gives the state immunity from wrongful death lawsuits. In April 2017, Czirban Concrete Construction, the contractor by whom Reagan was employed, was fined $20,000 for failing to report the fatality, failing to require seat belts on the equipment, failing to warn employees of the applicable hazards, and other offenses. Ian Czirban, the head of the company, was also charged by Monterey County prosecutors with six felonies for tax evasion, insurance fraud, and a misdemeanor charge for failing to maintain workers' compensation insurance. Czirban disputed the fines and charges, saying that he was not Reagan's employer and did not own the equipment at issue. He entered a plea of "not guilty" on May 11, 2017. As of July 2018[update], the case was ongoing. Another company, Industrial Defense Development, was fined $6,000 for injuries that another firefighter sustained when the water truck he was driving rolled over an embankment. On August 2, 2016, officials announced that their investigation found that the fire had been caused by an unattended illegal campfire. While no suspect was identified, Monterey County District Attorney Dean Flippo said that, if an arrest were made, the culprit could be charged with negligence and manslaughter. ^ a b c d e f g "Soberanes Fire". InciWeb. Retrieved 15 September 2016. ^ a b Gilpin, Lyndsey (October 5, 2016). "The Most Expensive Wildfires in US History". High Country News. Retrieved July 18, 2018. ^ Geiling, Natasha (23 September 2016). "California fire becomes the most expensive in history". ThinkProgress. Retrieved 15 November 2016. ^ "Soberanes Fire map". InciWeb Incident Information System. National Wildfire Coordinating Group. Retrieved August 6, 2016. ^ "SOBERANES FIRE". Big Sur Fire Brigade. 12 October 2016. Retrieved 4 October 2016. ^ a b c Larson, Amy (2 August 2016). "Soberanes Fire caused by illegal unattended campfire, Cal Fire says". Retrieved 2 August 2016. ^ Precious time was lost between the time the hikers spotted the fire and were able to hike to a location where they could connect to a cell phone repeater to report it. ^ Seaver, Lauren (23 July 2016). "2,000-acre Soberanes Fire in Garrapata State Park forces evacuations". KSBW. Retrieved 24 July 2016. ^ a b Seaver, Lauren. "Soberanes Fire grows to 10,262 acres; containment up to 5 percent". KSBW. Retrieved July 24, 2016. ^ "Acting Governor Torlakson Declares State of Emergency in Los Angeles and Monterey Counties". Office of the Governor. July 26, 2016. Retrieved July 31, 2016. ^ Myers, John (July 25, 2016). "Who's governor of California? This week, it's not Jerry Brown". Los Angeles Times. Retrieved August 1, 2016. ^ Leyde, Tom (July 30, 2016). "Soberanes Fire spreads further into Los Padres Forest". Monterey Herald. Retrieved July 31, 2016. ^ "Soberanes Fire". California Department of Forestry and Fire Protection. August 26, 2016. Retrieved August 30, 2016. As of August 26, CAL FIRE is no longer in unified command of the fire as the majority of the activity is now burning on National Forest Land. ^ "Soberanes Fire update for Aug. 30, 2016". InciWeb Incident Information System. National Wildfire Coordinating Group. Retrieved August 30, 2016. ^ Thomas, Madeleine (September 22, 2016). "California's Soberanes Fire Is the Most Expensive in America — Ever". Pacific Standard. Retrieved 10 October 2016. ^ "Soberanes Fire Latest: Fatality Reported, 20 Homes Destroyed". Patch Media. July 27, 2016. Retrieved July 27, 2016. ^ "Bulldozer operator killed fighting Soberanes Fire identified". KSBW. July 29, 2016. Retrieved July 30, 2016. ^ Alexander, Kurtis (October 2, 2016). "Soberanes Fire nears record firefighting cost in U.S." San Francisco Chronicle. Retrieved 1 December 2016. ^ Alexander, Kurtis (October 6, 2016). "Giant Pacific madrone is a likely victim of Soberanes Fire". seattlepi.com. Seattle Post Intelligencer. Retrieved 1 December 2016. ^ California State Parks (September 28, 2016). "Areas of Garrapata State Park to Remain Closed". www.parks.ca.gov. Retrieved 4 December 2016. ^ Goldberg, Ted (March 22, 2017). "Family of Bulldozer Operator Killed in Soberanes Fire Suing California". KQED News. Retrieved April 19, 2017. ^ "A 1960s Law Blocks Firefighting Contractors From Suing State". KQED. 8 November 2017. Retrieved 18 July 2018. ^ a b Bodley, Michael (March 14, 2017). "State fines 2 companies thousands for Soberanes Fire accidents". San Francisco Chronicle. SFGate. Retrieved April 19, 2017. ^ a b c Lyons, Jenna (April 18, 2017). "Contractor fined in Soberanes Fire death facing 6 new felony charges". SFGate. Retrieved April 19, 2017. ^ Goldberg, Ted (12 May 2017). "Employer of Contractor Killed in Soberanes Fire Pleads Not Guilty". KQED News. KQED. Retrieved May 24, 2017. ^ "Case SS170589A People of the State of California vs. Czirban, Ian Nathaniel". portal.monterey.courts.ca.gov. Retrieved 19 July 2018. Wikimedia Commons has media related to Soberanes Fire. "Soberanes Fire Updates". Cal Fire Incident Information. CalFire. Retrieved August 2, 2016. "Soberanes Fire". InciWeb Incident Information System. National Wildfire Coordinating Group. Retrieved August 2, 2016. "Soberanes Fire, California". Earth Observatory. NASA. Retrieved August 2, 2016. Satellite photos of the Soberanes Fire. "Time Lapse Maps: How the Soberanes Fire spread". KSBW. August 1, 2016. Retrieved August 2, 2016. This page was last edited on 28 December 2018, at 15:20 (UTC).